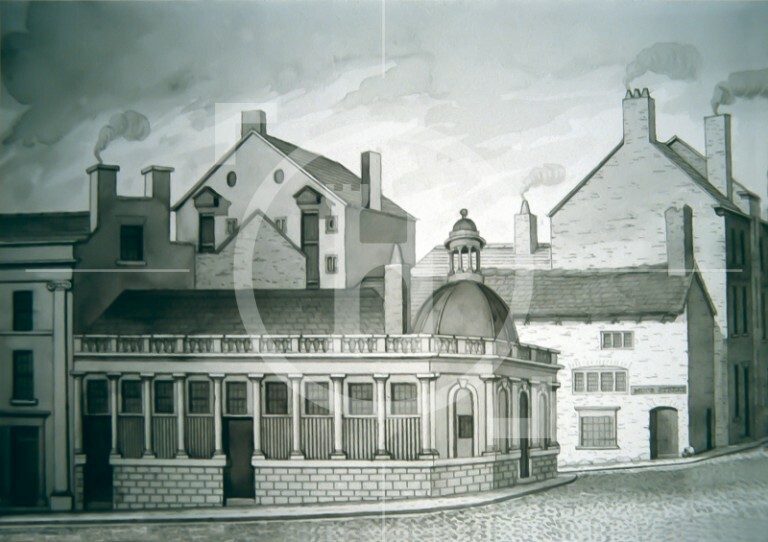 The Fish Market was originally at the bottom of Chapel Street and was connected with the fish yards leased to the Tarleton family, who were allowed to levy tolls on all fish, potatoes and other root vegetables which were sold there. In the mid-1700s, the butchers were in High Street, the Fish Markets were in Pool Lane (later South Castle Street), and at Chapel Street, and the general markets were around St.George's Church (previously the site of the Castle), in Castle Ditch and at the White Cross at the intersection of Tithebarn and Old Hall Streets. With the opening of St John's Market in 1822, a notice was given that the fish markets on the north side of James Street and the south side of Moor Street were to be discontinued.The Old Fish Market, at the top of James Street, opened as a general market, on December 1 1826, but the market was finally closed in 1839 and the building was demolished. By 1835 a retail Fish Market had been erected close to St.John's Market. A few years later a wholesale Vegetable, Fruit and Hay Market was established and, in 1886, a wholesale Fish Market was erected adjoining the retail Fish Market. On June 4 1889 the new wholesale Fish Market, Great Charlotte street, opened.